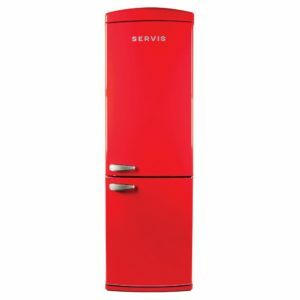 If you're looking to add a splash of retro to your kitchen then this freestanding retro frost free fridge freezer from Servis could be right up your street! Finished in a stunning gloss red with chrome handles the C90185 will add a real wow factor to your kitchen. Offering an impressive 318 litres of net capacity and adjustable shelves it's not only good to look at but offers practical and flexible storage. It also has an A+ energy rating which is great news for your energy bills and for an added bonus this fridge freezer also comes with a 5 year warranty! How's that for peace of mind.